In the late 18th Century the “Age of Fighting Sail” was reaching the peak of its efficiency in a time when Britain and France were almost continuously at war. It is easy therefore for one’s perception of life at sea in this era to be dominated by images of skillful seamanship, intrepid commanders, desperate frigate actions and major fleet actions. One tends therefore to forget that running in parallel with this spectacular history was the sordid, brutal, shaming fact of the slave trade. 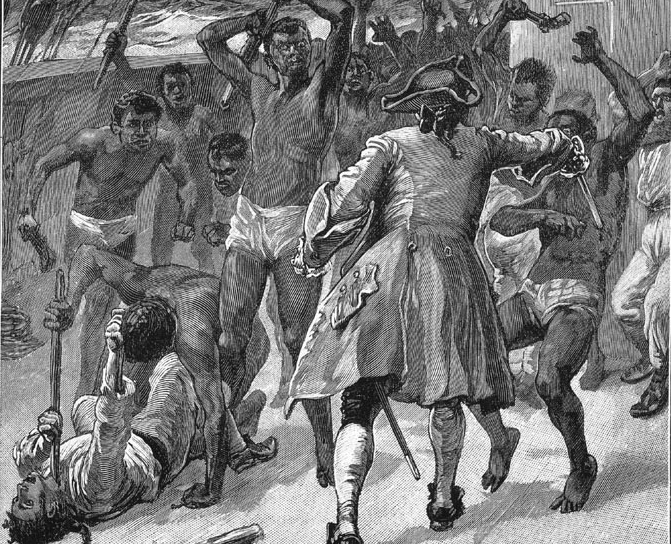 The scale was vast – it was estimated at the time that in 1768 some 104,000 slaves were shipped from West Africa by the main Western European nations. To its eternal credit, Britain was to abolish the trade in 1807 and other European nations followed suit in the subsequent decades. Through much of the 19th Century a major role for Britain’s Royal Navy was suppression of both Atlantic and Indian Ocean slaving. This was in stark contrast to the previous century, when British slavers were entitled to as much protection as traders shipping any other type of merchandise. Crammed like sardines into fetid holds, often too low to stand up in, African slaves were subjected to a passage from West Africa to the Americas that could last up to fifty days. The mortality was appalling, and on occasion captains did not hesitate to drop diseased slaves overboard so as to be able to claim on insurance. It is little wonder therefore that on occasion slaves did manage to revolt and take over control of ships, usually only temporarily. One such slave revolt occurred in 1769 and the following account of it is based on a 1769 account by a Mr. Boulton, which have seen reprinted in W.Clark Russell’s “Between the Headlands”, published in 1889. 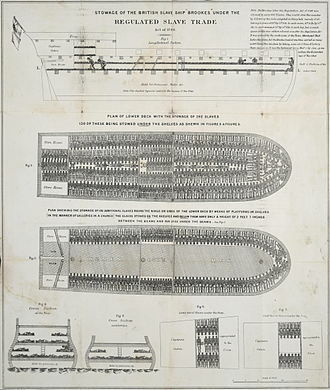 A plan of the actual slave ship Brookes in the late 18th Century. 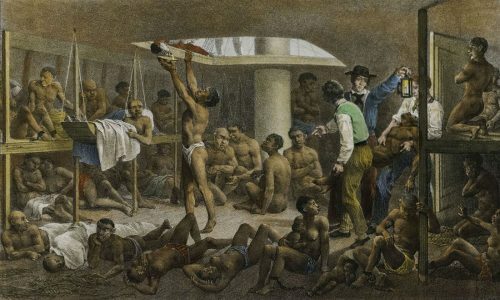 This was drawn for Britain’s Anti-Slavery movement and was distributed widely – including among parliamentarians – to raise awareness of the actual horrors of the trade. It was perhaps one of the most powerful – and successful – images ever used to evoke outrage and to prompt demands for abolition of a shameful trade that nonetheless had major economic importance. It shows 454 slaves were accommodated on board but it appeared that on occasion she carried as many as 609 people. Given the close confinement – most slaves could neither sit up nor stand up – and the lack of sanitation, disease was rampant and a significant percentage, especially among women and children, could be expected to die on each crossing. Boulton’s function on the inappropriately named slave-ship Delight is undefined in his account but the vessel, laden with slaves, was sailing from West Africa in company – though apparently not closely – with another slaver named the Apollo. The sizes of these ships, and the numbers of slaves, are not specified by Mr. Boulton. His account is notable for its air of injured innocence – he is outraged by the undoubted horrors committed by the slaves – described as butchers and savages – but he clearly saw nothing wrong with the abuses that had prompted such slaughter or the trade he was engaged in. Boulton managed to clamber up the shrouds to the maintop, where he found that the cook and a cabin boy had also reached safety there, for however long that might last. Looking down he saw two other crew members emerge on deck – one sprinted to the shrouds and gained the maintop but the other was overwhelmed and killed. Between them, the four men in the maintop had two knives and some fresh water. Boulton now climbed up to the maintopmast stay and moved hand over hand along it to the foretop, where he found another knife. He must have been extraordinarily strong an nimble for he managed to return to the main mast by the same route. While doing so he was assailed by billets of wood thrown up by the slaves on deck. The maintop itself was a relatively secure location and Boulton was confident that he and his companions could resist any attack from below unless firearms were brought to bear. The Delight was now drifting with untrimmed sails, and with nobody at the helm, but her consort, the Apollo was approaching. As she did some of the slaves broke open the arms chest. Some seemed to have some acquaintance with firearms and two began to shoot upwards. One of Boulton’s companions – the last to climb from the deck –was so terrified by tis that he descended, “stupidly supposing the slaves would spare his life that he might steer, make sail for them, and the like; but as he stepped out of the shrouds, his skull was split open with an axe, and his body thrown overboard.” The Apollo was still closing and the slaves were still firing up at the maintop. Realising at last that they could not hit the men sheltering there, one slave, armed with a pistol and a cutlass, began to climb the shrouds. As his head appeared above the edge of the maintop, Boulton struck him “with a quart bottle” and he fell into the sea. Apollo opened fire on the Delight – her armament cannot have been heavy and she seems to have stood off and maintained what only have been a weak bombardment for four hours. This culminated in a lucky shot exploding a barrel of gunpowder on the Delight, and starting a fire. Boulton – still in the maintop – called to the Apollo’s captain to board. The slaves by now seemed to have been cowed by the fire and to have lost the will to resist. Boulton, the cook and the boy descended safely to the deck and Apollo’s men managed to get the fire under control. 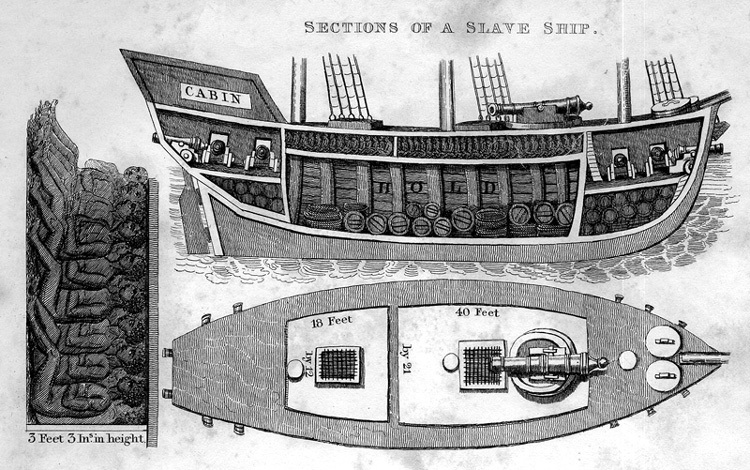 Cross-section of armed slave ship, from Robert Walsh’s “Notices of Brazil in 1828 and 1829“. Note that slaves can only crouch, not stand. 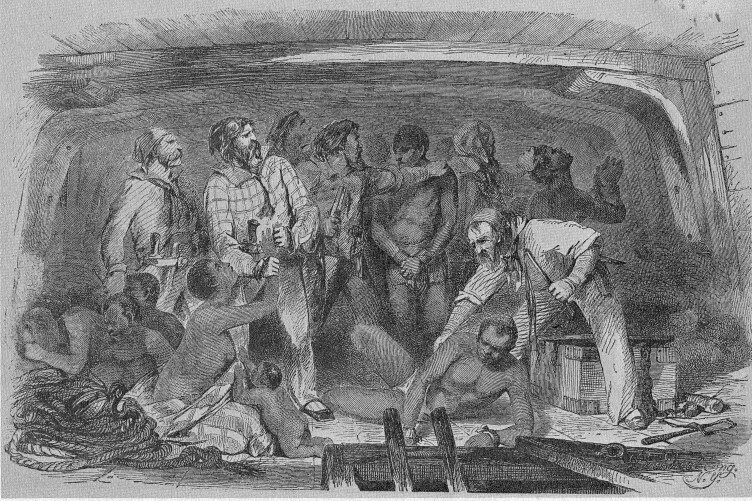 The final death-toll was nine European members of the Delight’s crew and eighteen slaves. One wonders what became of the slaves afterwards – being considered valuable “live merchandise” one suspects that greed rather than humanity might have caused their lives to be spared. If so, the extended hell of the trans-Atlantic voyage still lay before them and for those who survived years of brutal exploitation were to be endured in the plantations of the New World. Tragically, one cannot but wonder if the most fortunate slaves were the eighteen who had died in the doomed uprising. Interesting location and type of cannon on the Armed Slaver. The gun is positioned so it can be bought to bear on the cargo through the hatch and it is not a breech loader like the majority of merchantman cannon (as on East Indiamen “Blackwall Frigates” for example). Breechloader cartridges are normally just a relatively small single ball but this cannon was probably loaded with the equivalent of buckshot or dice as an anti-personnel load. Many thanks for this John – I hadn’t realised that buckshot wold have been used like this, but indeed it makes sense. The blast from a cannon of this size must have been horrific in its effects.